Only after I moved away from Hawaii (twice!) did I realize how amazing Hawaii cuisine really is. It’s not just the “fancy” stuff, but rather the everyday foods that make Hawaii cuisine unique, delicious, and addictive! 1. Poi: Poi made it on the list because it’s one of the most historic foods in Hawaii. Ancient Hawaiians used to eat this as a staple of their diet and also feed it to their babies, so they would “bulk up.” Of course, even today, eating too much poi will cause anyone to “bulk-up” (it’s mostly carbohydrates). But, the food is so unique and interesting, you should definitely try it while you’re here. What is poi? It’s the underground plant stem or corm of the taro plant (known in Hawaii as kalo). 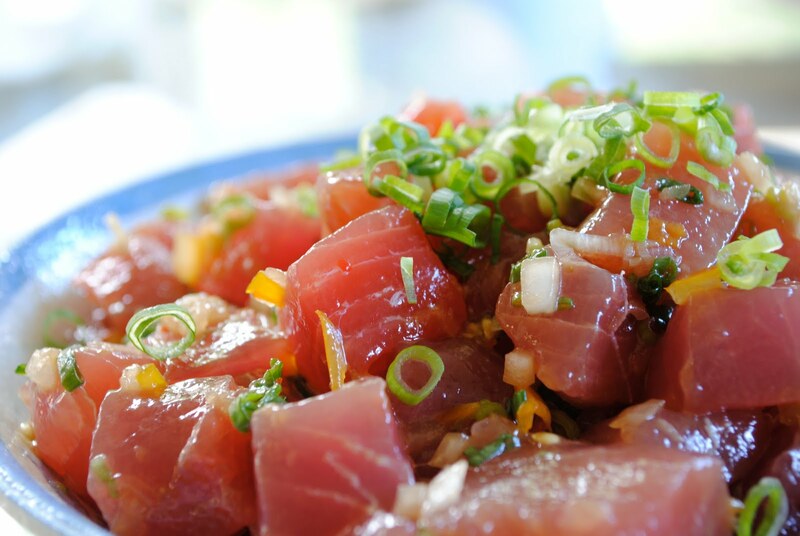 Poke typically consists of raw fish, usually ahi (yellow fin tuna), and local and asian seasonings. Poi is produced by mashing the cooked corm (baked or steamed) until it is a highly viscous fluid. Water is added during mashing and again just before eating to achieve the desired consistency, which can range from liquid to dough-like. Hint: add sugar! 2. Laulau: If you’re in Hawaii and order a plate lunch, you may be offered the main dish of “laulau,” and it would be worth your time to try it. Basically, laulau is pork, beef, chicken, or salted butterfish wrapped in taro leaves. Then, the ends of the lea are folded and wrapped again.. When ready, all the laulau is placed in an underground oven, called an imu. Hot rocks are placed on the dish and covered in banana leaves and buried again. A few hours later the laulau is ready to eat. 3. Poke: Admittedly, I’m not a fan of fish, but even I love the sight of a nicely-prepared poke. I recommend only eating poke at a semi-nice/nice restaurant because we’re talking raw fish here. Poke is the Hawaiian verb for “section” or “to slice or cut.” Traditional forms are aku (an oily tuna) and hee (octopus). Increasingly popular ahi poke is generally made with yellowfin tuna. Adaptations may feature raw salmon or various shellfish as a main ingredient served raw with the common “poke” seasonings. 4. Mochi: I’ll also add “mochi ice cream” to this one because it’s my kids’ favorite. Mochi is a Japanese rice cake that’s pounded into a paste and then molded into the desired shape. Mochi is especially popular during the Japanese New Year. Now, mochi ice cream is something else! The mochi actually surrounds the frozen ice cream in the middle, and the kids are crazy for it. You can find it at Bubbies Ice Cream stores, Foodland, and Costco. One of Hawaii's tastiest foods, Kalua pig, is often the featured entree at Hawaiian luaus. 5. 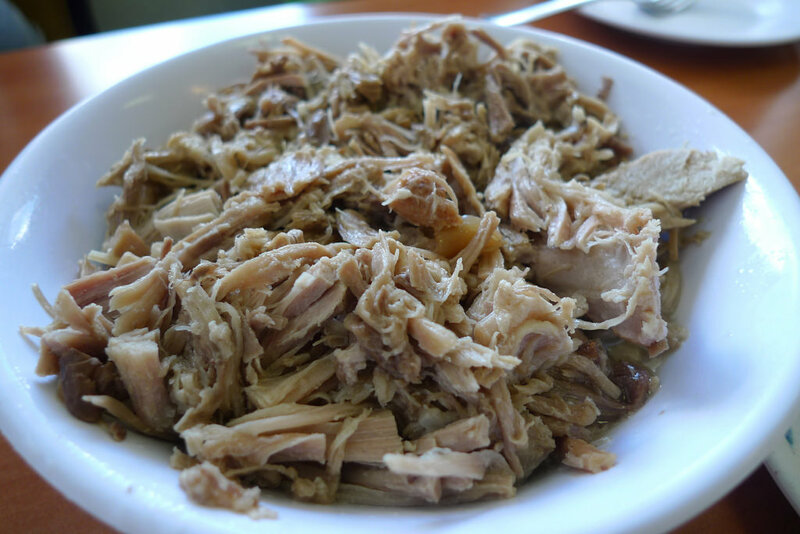 Kalua Pig: You may THINK you’ve tried slow-cooked pork before, but if you haven’t tried it after it’s come out of an underground oven, then you haven’t really experienced how delicious the meat can be. Kalua is a traditional Hawaiian cooking method that utilizes an imu, a type of underground oven. Kalua Pig is basically an entire pig that’s cooked in an imu, sometimes overnight, but almost always for hours and hours. By the time it’s removed from the imu, you have a unique-tasting, hearty meal waiting for you! And, don’t forget — if you want to experience Hawaii food like a pro, make sure you book an Aloha Plate Tour through Hawaii Aloha Travel or Hawaii Jeep Tours. While on the tour, you’ll stop at some of the most interesting and “out of the way” eateries on Oahu, where your guide, Lanai Tabura, will teach you about Hawaii cuisine and what makes it unique and delicious.